PHILADELPHIA (WPVI) -- Allen Iverson is returning to the basketball court in Philadelphia. Just this time, it's a whole new ballgame. 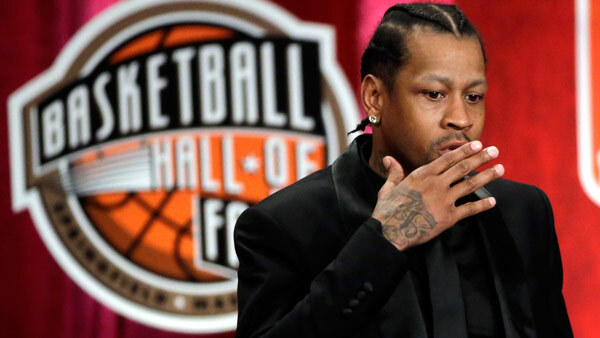 Iverson is taking part in the inaugural BIG3 Basketball games at the Wells Fargo Center on Sunday, July 16. BIG3 games consists of 3-on-3 half-court play with the first team to score 60 points winning. It also features professional basketball's first four-point shot. Here are the details: There are eight teams of five players with one coach per team. The regular season is eight weeks long followed by playoffs and the Week 10 championship. Iverson, coach and captain of the 3's Company team, is not the only BIG3 participant with a Philly connection. New rules. New style of play. The @thebig3 is going to change everything. South Philadelphia native and former La Salle University basketball player Rasual Butler will play. And Hall of Famer Julius "Dr. J" Erving will be a coach for the Tri State team. Tickets go on sale on Saturday, May 20 at 10 a.m. through WellsFargoCenterPhilly.com, by phone at 1-800-298-4200, or in person at the Wells Fargo Center box office. BIG3 was founded by producer, actor and musical artist Ice Cube and entertainment executive Jeff Kwatinetz.